Moving about under dense scrub vegetation off Magadi Road, Kenya. Dec. 2015. This is a common species of seasonally dry scrub habitat throughout Kenya. The slender bill is best for capturing swift-moving, soft-bodied insects. Notice bright reddish brown on the tail and lower back. Back and crown are variously gray brown to red-brown. The bright white eyebrow is diagnostic. The scrub-robin frequently lifts its tail and spreads the feathers. 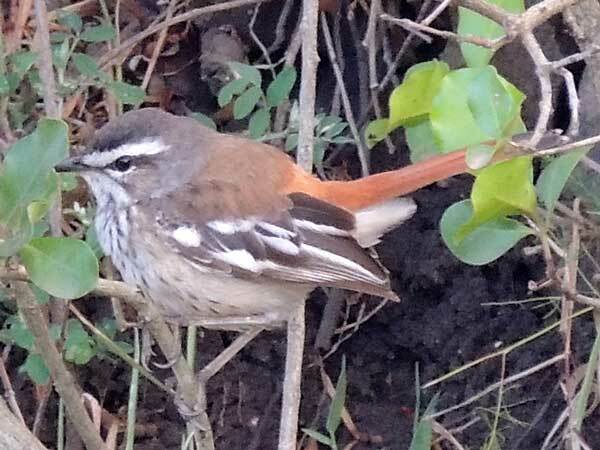 Subspecies names have been applied to the many variations in the amount of white and rufous in the wings and back. Copyright Michael J. Plagens, page 3 Oct. 2015.